Émile E. C. Mathis was a French automobile dealer who began manufacturing cars under his own name in 1910. Mathis was based in Strasbourg, which was part of Germany at the time. The Mathis automobile began to achieve success just before World War I. After the start of the war, Émile was conscripted into the German Army. Because of his knowledge of automobiles, the Germans sent Émile on a mission to Switzerland to purchase trucks and other supplies. Émile was given a substantial amount of money for the transaction, and he took the opportunity to desert the Germany Army and keep the funds. When Germany was defeated, Émile returned to his automobile company in Strasbourg, which was then in French territory near the German border, and resumed production. The high-performance, 42-cylinder Mathis Vega aircraft engine. Note the camshaft-driven distributors attached to the front of each cylinder bank. In 1937, the Mathis company began designing aircraft engines. A new company division, the Société Mathis Aviation (Mathis Aviation Company), was founded with offices in Paris and factories in Strasbourg and Gennevilliers. These were mostly the same facilities as the automobile business, with auto development out of Strasbourg and aircraft engine development centered in Gennevilliers, near Paris. Raymond Georges was the technical director in charge of the aircraft engines. The Mathis company started their involvement in aircraft engines with the rather ambitious Vega. 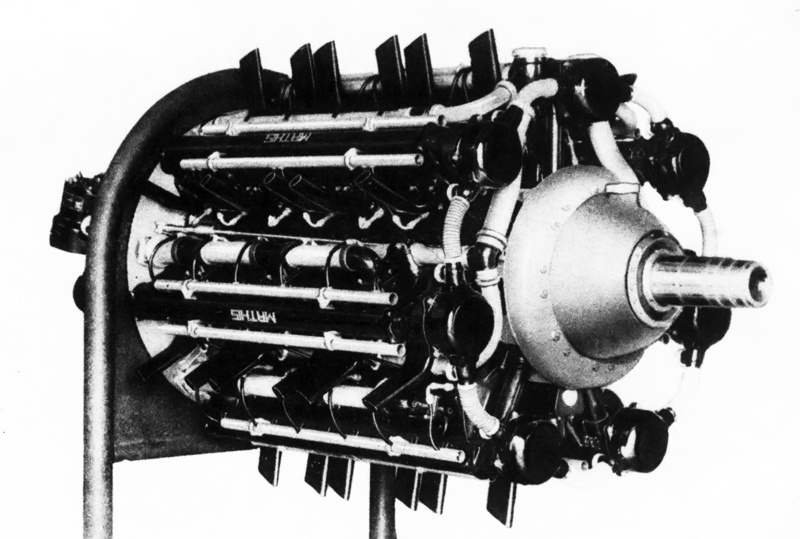 The Mathis Vega was a 42-cylinder inline radial aircraft engine. The liquid-cooled engine had seven cylinder banks, each with six cylinders. The cylinder banks had an integral cylinder head and were made from aluminum. Steel cylinder barrels were screwed into the cylinder bank. Each cylinder had one intake valve and one sodium-cooled exhaust valve. A single overhead camshaft actuated the valves for each cylinder bank. The camshafts were driven from the front of the engine. Camshaft-driven distributors mounted to the front of each cylinder bank fired the two spark plugs in each cylinder. The spark plugs were positioned on opposite sides of the cylinder. The two-piece crankcase was made from aluminum. The Vega was a relatively compact engine. Note the exhaust port spacing on the cylinder banks. Presumably, different exhaust manifolds would be designed based on how the engine was installed in an aircraft. At the front of the engine was a planetary gear reduction that turned the propeller shaft at .42 times crankshaft speed. At the rear of the engine was a single-speed and single-stage supercharger that turned at 5.53 times crankshaft speed. A single, two-barrel, downdraft carburetor fed fuel into the supercharger. Seven intake manifolds extended from the supercharger housing to feed the air/fuel mixture to the left side of each cylinder bank. Individual exhaust stacks were mounted to the right side of each cylinder bank. Attached to the back of the supercharger housing was a coolant water pump with seven outlets, one for each cylinder bank. The Vega had a 4.92 in (125 mm) bore and a 4.53 in (115 mm) stroke. The 42-cylinder engine displaced 3,617 cu in (59.3 L) and had a compression ratio of 6.5. The Vega was 42.1 in (1.07 m) in diameter and 59.8 in (1.52 m) long. The first Vega was known as the 42A, and the engine was first run in 1938. The 42A produced 2,300 hp (1,715 kW) at 3,000 rpm and weighed 2,756 lb (1,250 kg). Reportedly, two examples were built as well as a full-scale model. It is not clear how much testing was undertaken, but some sources indicate the engine was flown 100 hours in a test bed during 1939. Unfortunately, details of the engine’s testing and the aircraft in which it was fitted have not been found. An improved version, the 42B, was under development when the Germans invaded in May 1940. The Vega engine program was evacuated from Gennevilliers and hidden in the Pyrenees mountains in southern France for the duration of the war. Believing that the Germans would not have forgotten his desertion and miss-appropriation of funds during World War I, Émile fled to the United States in 1940. Émile offered the Vega engine to the US Military in October 1942, but no action was taken. Rear view of the Vega displays the intake manifolds, single carburetor, and the seven-outlet water pump. On paper, the Vega was a light and powerful engine, but no details have been found regarding its reliability. 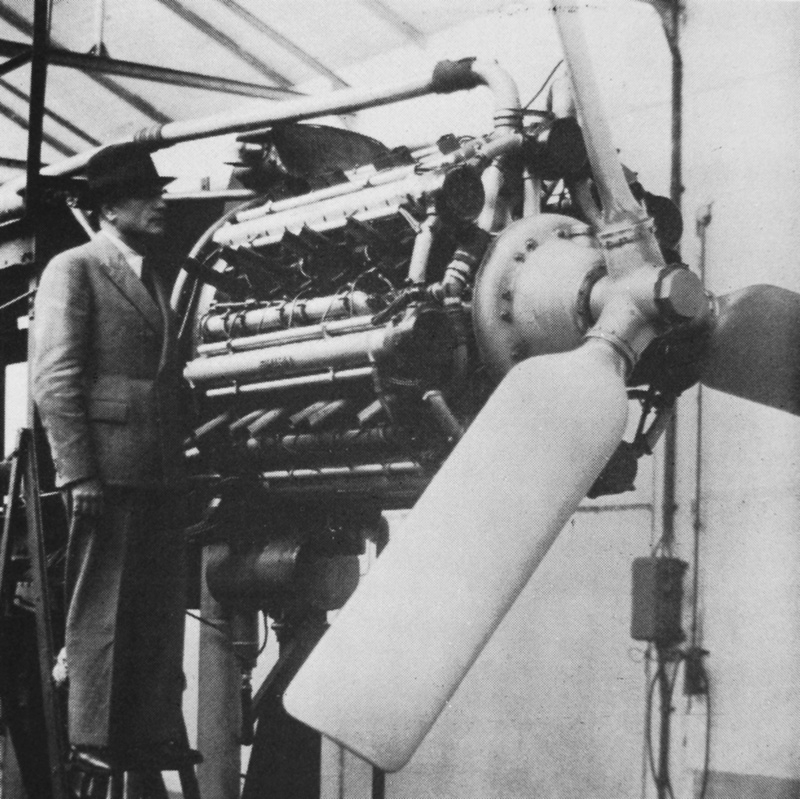 After World War II, Émile returned to France, and work resumed on the Vega engine. The 42B was updated as the 42E (42E00). In all likelihood, the 42B and the 42E were the same engine; an example was exhibited in Paris, France in 1945. The Vega 42E produced 2,800 hp (2,088 kW) at 3,200 rpm with 8.5 psi (.59 bar) of boost for takeoff. The engine was rated for 2,300 hp (1,715 kW) at 3,000 rpm at 6,562 ft (2,000 m) and 1,700 hp (1,268 kW) at 2,500 rpm at 13,123 ft (4,000 m). The engine weighed 2,601 lb (1,180 kg). The design of an enlarged Vega engine was initiated in 1942. Originally designated 42D, the larger engine was later renamed Vesta. The 42-cylinder Vesta was equipped with a two-speed supercharger that rotated 3.6 times crankshaft speed in low gear and 5.7 times crankshaft speed in high gear. The engine had a .44 gear reduction and utilized direct fuel injection. The Vesta had a 6.22 in (158 mm) bore, a 5.71 in (145 mm) stroke, and a displacement of 7,287 cu in (119.4 L). The engine had a takeoff rating of 5,000 hp (3,728 kW) at 2,800 rpm with 8.5 psi (.59 bar) of boost and a normal rating of over 4,000 hp (2,983 kW). The Vesta was 52.0 in (1.32 m) in diameter and weighed 4,519 lb (2,050 kg). Like many other large engines built toward the end of World War II, the Vega failed to find an application, and the Vesta was never built. 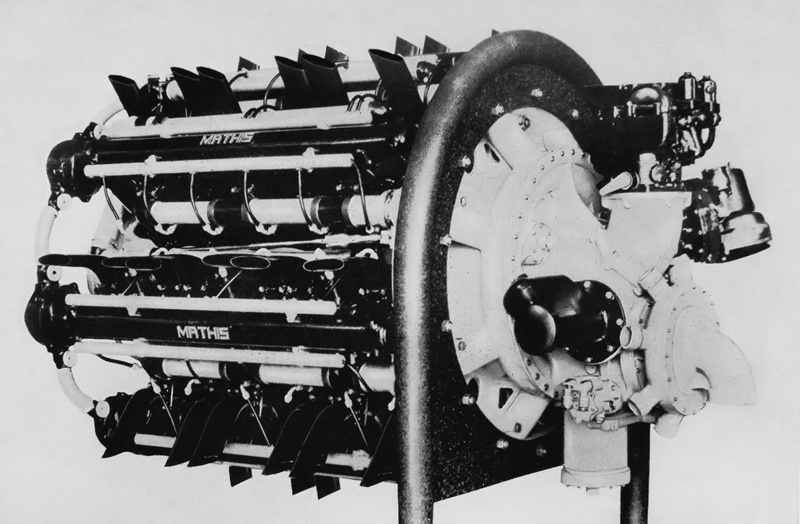 Mathis continued work on aircraft engines and produced a number of different air-cooled engines for general aviation. 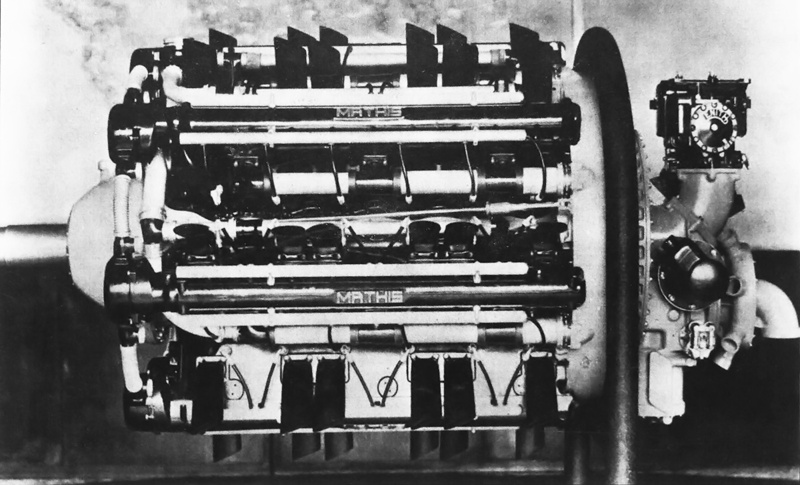 The design of these smaller engines was initiated during the war, and every attempt was made to maximize the number of interchangeable parts between the smaller engines. Some of the material for the smaller engines was liberated “scrap” provided by the Germans and intended for German projects. However, the general aviation engines were not made in great numbers, and production ceased in the early 1950s. No parts of the Vega engines are known to have survived. Raymond Georges overlooks the Vega engine mounted on a test stand in 1939. The pipes above the Vega are taking hot water from the engine. This entry was posted in Aircraft Engines, World War II on 5 December 2018 by William Pearce. Whoa! 84 spark plugs to change, 84 valves to adjust. Thanks, William!